Explore & Experience the Different Levels Within the Dream Realm! This is another of Giovanni's personal favorite titles, and was actually inspired by the movie Inception. He designed this program to help people reach the different levels of dream consciousness and to actually be able to direct their dreams & outcomes for their own advantages. It is like a training program for dreaming, and through hypnosis, you will be personally guided into the different levels throughout the course of the recording. In doing so you can train your mind to have much more control over your dreams and begin experiencing the immense benefits that directed dreams bring to your waking life too. The recording starts out with a light induction to get you into a nice alpha level of trance. Herein Giovanni instructs you to begin visualizing & building the picture for what you wish to dream about. You will then be guided further into trance where your subconscious becomes more prominent and the magic begins to happen. 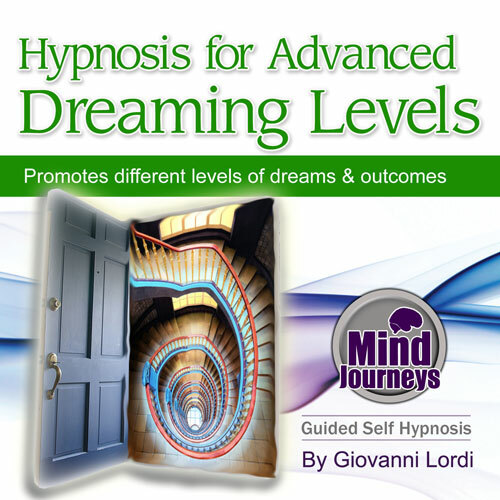 From here Giovanni will keep guiding you down into different levels within your mind, and at each level you will be given time on your own accord to create your dream in any way that you wish. As you keep going further down into trance, the binaural background soundtrack follows suit, helping entrain your mind into the right zones for the different levels of dream to happen. Essentially every time you use this program you can expect a different result. The more you use it, the more you will find that you have control over your dreams and master the art of having dreams within a dream like the movie Inception. Although most of this recording is simply about guiding your into different levels, there are some suggestions along the way to help train your mind in the right direction. "Inner peace, awareness, great wisdom, I can, I will, advanced dreaming easy, I advance dream anytime at will, right intentions, positive, moral, happy, confident."